The 71X6-00305 supports IEEE 802.3az Energy Efficient Ethernet to provide power-saving benefits without compromising performance. One of the ways it does this is by automatically detecting the length of connected cables and can adjust power usage by saving energy on shorter cable connections. The stylish, compact wall-mountable housing of 71X6-00305 fits any working environment. 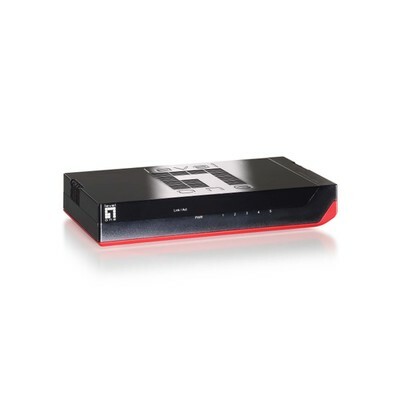 It comes with 5 10/100/1000Mbps ports to meet SOHO and home network expansion needs. The 71X6-00305 features plug-and-play for easy installation. No configuration is required. Autonegotiation on each port senses the link speed of a network device and adjusts for compatibility and optimal performance. More Product InfoThe 71X6-00305 Gigabit Ethernet Switch is designed for reliable high-performance networking. With its non-blocking switching fabric in full-duplex mode, this switch can deliver up to 2000Mbps per port, while the Store-and-Forward service brings low latency and error-free packet delivery. This highperformance Gigabit Ethernet switch is perfect for fulfilling the demands of online gaming and multimedia streaming. Moreover, this switch also supports IEEE 802.3az Energy Efficient Ethernet which helps reduce power consumption.